The EAA Vintage Aircraft Hall of Fame was established in 1993 to honor the outstanding achievements of men and women who share the spirit of EAA’s founder: a passion for the freedom that flight offers. Those inducted into the Hall of Fame are selected by their peers for the myriad of contributions made to their particular realm of flight – and aviation as a whole. Wish to Nominate Someone for the EAA Vintage Hall of Fame? Please click here to download and print a nominating petition. Phil Coulson of Lawton, Michigan, has been immersed in aviation for all of his adult life. Phil enlisted in the U.S. Air Force during the Korean War and, on his return to Michigan, learned to fly in a prewar Piper J-5 Cruiser. Phil had discovered a passion for sport aviation, and began attending the early EAA conventions at Rockford starting in 1962. Phil began volunteering with EAA at Rockford, and then at Oshkosh, where he became an advisor in the Antique/Classic Division in 1985, followed by election to its board in 1987. During this period, Phil acquired a Waco UPF-7 open-cockpit biplane. The experience of owning the Waco, and the camaraderie with other owners that followed, led Phil and his friends to organize the American Waco Club (AWC) in 1993. Phil was named the founding president, a leadership position he continued until his retirement in 2013. Phil also edited and published the Waco World News, the publication of the AWC. In addition to the UPF-7, Phil and his wife, Ruthie, have owned a G35 Bonanza, a Cessna 190, a Waco INF, a Waco 10, and a rare Waco UBA. As a director of the Vintage Aircraft Association, Phil has chaired the annual Vintage Parade of Flight during EAA AirVenture Oshkosh and served as a long-term senior judge in the Antique category. Phil chose to take emeritus status with the VAA board in the fall of 2015 after nearly 30 years of active, involved, and dedicated service to both EAA and the VAA. Dale “Gus” Gustafson, 40-year member of the Vintage Aircraft Association board of directors, obtained a rare copilot job with (Roscoe) Turner Airlines in 1950, flying surplus World War II C-47s and DC-3s. He served as Vintage chief judge for 40 years, in addition to serving 10 years as president of Indianapolis EAA Chapter 1311.He owned, flew, and restored various airplanes, including a Stearman, Piper J-4 Cub Coupe, and Aeronca 11AC Chief. Gus passed away June 26, 2014. During the last weeks of his life, just like Paul, Gus was busy making plans to attend EAA AirVenture 2014 and tour the Vintage area. The EAA Sport Aviation Halls of Fame were established to honor the outstanding achievements of men and women in aviation who share the spirit of EAA and its community. Those inducted into the hall of fame are selected by their peers for the myriad of contributions made to their respective areas of aviation. Timothy Talen, founder of the Oregon Antique & Classic Aircraft Club and founding director of the Oregon Aviation Historical Society, is an aircraft restoration master. In addition to many partial restorations, Timothy has fully restored at least 20 airplanes, including seven Interstates, a Cessna 120, two Cubs, a 1932 Fairchild 22, and many more. His award-winning restorations have graced many covers of EAA’s Vintage Airplane magazine, and he has an uncanny ability to look at any antique part and name the aircraft it came from. Tim’s father taught him to fly in an Aeronca Champ, and Tim earned his private pilot certificate in 1969. Since then, Tim has earned instrument, commercial, multiengine, and CFI ratings and certificates, as well as an A&P certificate. He served as an air traffic controller in Vietnam, and taught aircraft construction and technology at Lane Community College for five years, during which time his classes built a replica of Les Long’s Longster. 2012 – Clyde Smith, Jr. – Longtime Piper restoration expert Clyde Smith, Jr. has been selected as the 2012 VAA Hall of Fame inductee. The induction ceremony will take place the evening of Thursday, November 15, 2012. His expertise with regard to the restoration and maintenance of the fabric-covered series of Piper aircraft is second to none. Smith’s willingness to share his expertise is legendary; since the 1970s he’s hosted forums at the Sun ‘n Fun fly-in and the EAA fly-in in Oshkosh, and for nearly two decades he’s conducted a series of how-to seminars around the country, teaching people what to look for when restoring a Piper, and the skills necessary to recover an airplane. 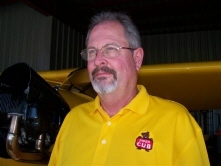 Clyde was one of the people instrumental in the creation of the yearly event that is now the Mecca for Cub enthusiasts, Sentimental Journey to Cub Haven fly-in which takes place every June. An outstanding restorer, Clyde’s restorations have won top awards at Sentimental Journey, EAA AirVenture, and Sun ‘n Fun, among others. 2012 – Clyde Smith, Jr.